Single pole single throw (SPST) pressure switches are a simple, low-cost method of monitor pressure in a system, and can be supplied with contacts “normally open” or “normally closed”. At Applications Engineering, we offer a range of SPST switches with variations in thread types, electrical connections and body materials. Adjustment ranges are from 0.1 to 1 bar to 30-300 bar, which is easily modified via the screw in the contact housing. 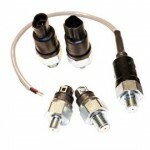 Please contact us if you need more information about our pressure switch range.